Australian electronic duo The Presets will be bringing their new live show to America for the first time as part of the Check Yo Ponytail tour. Along with The Presets, the annual road trek, slated to kick off at The Gothic in Denver on October 26, will also feature rapper Le1f, Antwon Chela and CYP founder Franki Chan. Check Yo Ponytail often attracts a diverse array of artists, with past tours featuring The Drums, Das Racist, Boys Noize, Skrillex and Big Freedia. In 2012 CYP even hosted The Rolling Stones at Echoplex, the iconic band’s first club appearance in nearly 20 years. The Presets own history with Chan and CYP goes back a decade, as the group’s first ever L.A. show was presented by Check Yo Ponytail. Since then, the band has gone on to play stages as diverse as Coachella and Folsom Street Fair to Mardi Gras and Glastonbury, setting fire to crowds with dance anthems that now include new singles “Goodbye Future” and “No Fun” as well as Nature World DJ’s new atmospheric remix of the latter. Listen to “No Fun (Nature World DJ’s Remix)” HERE, and view the full list of Check Yo Ponytail tour dates below. 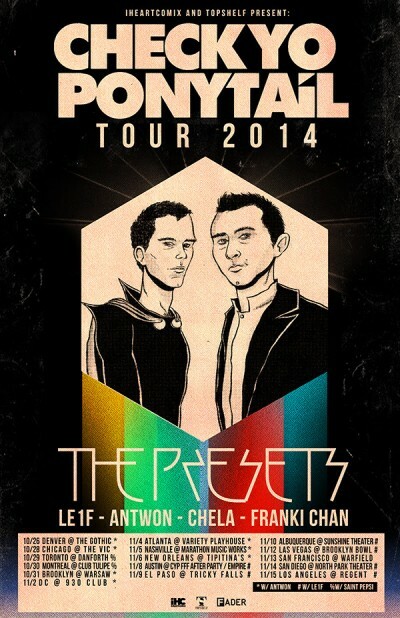 11/8 – Austin, TX @ CYP FFF After Party / Empire # (The Presets DJ set) FREE!